New Yorkers fed up with noisy nightlife have the odds stacked against them when filing complaints about loud bars and clubs. 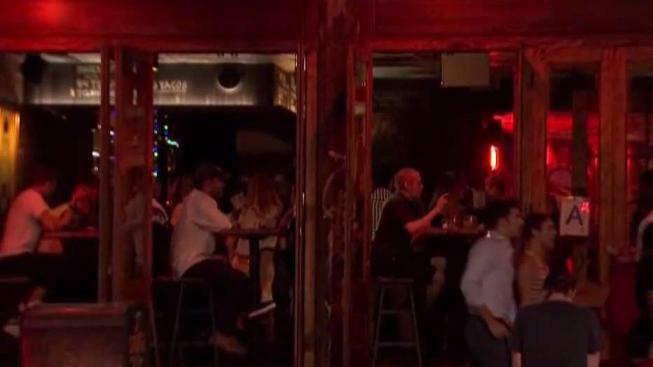 Since 2015, there have been about 61,000 complaints about noisy bars and clubs, according to New York City’s 311 database. But the NYPD issued just 237 summonses in response to those complaints, the same data shows. That means owners of nightlife businesses avoid summonses and fines more than 99 percent of the time. The NYPD has not responded to questions about that statistic, but 311 records show many noise complaints are resolved informally, without tickets, after visits from police. If residents are unsatisfied with the NYPD response, they can also escalate grievances to the city’s Department of Environmental Protection. But the I-Team found fines issued by the DEP are also few and far between. In the last five years, city records show 180 DEP violations issued under the part of the NYC Noise Control Code related to music played in commercial establishments. That amounts to an average of 36 tickets a year issued to bars, clubs, and restaurants citywide. "It’s irritating, but honestly not surprising," said a Lower East Side resident who wanted to remain anonymous for fear of retaliation by her rent-controlled landlord. After she summoned a DEP noise inspector, he failed to capture a noise meter reading indicating a violation. "I don’t know how many complaints I had to make to even get them to come out and do a reading to then know that, 'Oh, well, it was just pointless,'" she said. The DEP blames the relatively small number of noise violations on the fact that many complainants fail to provide sufficient contact information or cancel their request for an inspector. But Alan Fierstein, an acoustic consultant who helps New Yorkers document noise levels inside homes and businesses, says he believes city noise inspectors often fail to record violations because they often don’t isolate the lower frequencies associated with thumping bass. "Let me tell you what happens," Fierstein said. "An inspector has ears. They go to someone’s apartment. The complainant says, 'You can hear that restaurant, you can hear that bass booming through,' and they say, 'Yes, I’m sorry my meter doesn’t pick that up.'" Tara Deighan, a DEP spokeswoman, said all inspectors who are likely to investigate reports of excessive nightlife noise are trained to use meters that can isolate noise on both the "A-scale" and the "C-scale." But she said A-scale readings, which put more emphasis on higher pitched sound, are more likely to result in the recording of violations. "Under the City’s Noise Code, it is more likely that an inspector will be able to issue a violation against a commercial music establishment using the A scale, but where appropriate, the C scale is also utilized," Deighan said. C-scale readings put more emphasis on noises in the bass range of the sound spectrum – which are harder to hear, but cause palpable vibrations. Title 24, Chapter 2, Section 231(a) of the city’s Noise Control Code says restaurants can be fined for excessive noise on either the A-scale or the C-scale. In the last five years, the DEP has issued 180 summonses under that ordinance, but an examination by the I-Team found less than 10 percent of the tickets involved measurements that isolate the bass noise. Fierstein says the sparsity of tickets for booming bass explains why so many New Yorkers fail to get desired resolutions to their noise complaints. "They hear only the bass [and] the city doesn’t effectively measure that."